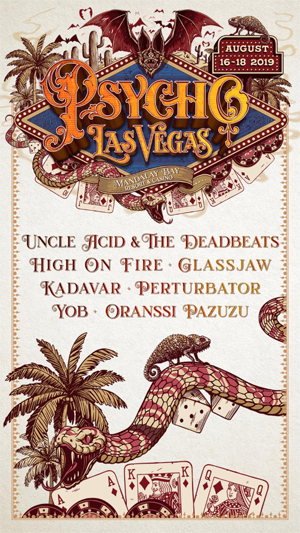 America's annual rock 'n' roll bacchanal PSYCHO LAS VEGAS will take over Mandalay Bay Resort And Casino next Summer. Set to take place from August 16th through August 18th, PSYCHO LAS VEGAS is unmatched in its level of presentation and 2019 promises not only a bigger and better festival but the experience of a lifetime. The event will feature four stages, including the newly renovated Events Center, the iconic House Of Blues, the Mandalay Bay Beach, featuring a wave pool and lazy river, and an old-school Vegas-style Lounge in the middle of the casino floor! The highly coveted "Psycho Special" passes sold out instantly, but Tier | Weekender General Admission passes are still available at $249, plus taxes and fees, but will increase to $299, plus taxes and fees, once the first tier sells out. Nab your tickets today at: VivaPsycho.com. Heralded as the vacation destination for those who worship all that is rock 'n' roll, PSYCHO LAS VEGAS' move to Mandalay Bay is a monumental milestone in the growth of the event. The resort is one of the crown jewels of MGM Resorts International and is home to over 3,000 affordable rooms, nine bars and lounges, and 24 restaurants. Occupying 120 lush acres of land on the Strip, the world-class property defines grandeur in every sense of the word while still providing a sense of seclusion fans have come to expect. Make no qualms about it, PSYCHO LAS VEGAS 2019 will usher in a new era of spectacle, performance, and production. Don't miss it!